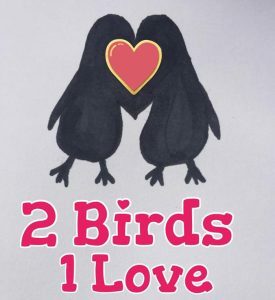 2 Birds 1 Love – Page 2 – 2 Birds 1 Love Lots Of Laughs! NB. we’ve actually been blogging for a couple of years now, but we’re about to up our game with even more regular posts, so stay in touch! So anyway, picture this! I was your modern day Bridget Jones, had been single like, forever, literally!! I had the occasional look on POF and the odd swipe (mostly left – seriously who are some of these men??!) on Tinder! But I genuinely thought I’d end up ‘left on the shelf’ childless and alone (queue violins!!) Everyone always said “you’ll meet the man of your dreams when you least expect it”, you know the usual clichés, but never in a million years did I think the ‘man of my dreams’ would end up being a woman!! Yep at the grand old age of 33 I fell for a girl! We have had to deal with ‘coming out’ to friends and family, which is probably the hardest thing we’ve ever had to do (don’t worry I’ll fill you in as time goes on!) but I can honestly say I’ve never been happier – and I’m pretty sure she feels the same way (Well she better bloody do! Haha!) I’ve definitely caught the best fish in the sea, my little Dory as I’ve pet named her, because my god the girl has outstanding short term memory loss! Here’s a bit more about my little fish…. Name – Char (aka Dory…I’m not even exaggerating about the short term memory loss – in fact I’ve just asked her to give me an example of a really funny time she forgot something, and she’s just looked at me blankly and said “Is that a joke??! !” Hahahaha!!! Just take my word for it!) Age – 25 (you’ve probably just clicked about the 10 year age gap! Yes I know, I’m a cougar! But age really is just a number where we’re concerned!) Job – Full time Mummy to ‘The Little Dude’ and what an amazing job she does! Our Hobbies/Interests – I love to cook and don’t think I’m half bad (which is lucky because Dory can’t really cook….her speciality is pasta and baked beans mixed together – don’t even get me started!! just Yuk!) although saying that we are both currently on a diet (when aren’t we on a diet? ), and so making meals tasty and exciting proves a little difficult at times, especially as Char is a fussy eater! But I like a challenge! I’m a Huge Disney fan – movies, music, merchandise, theme parks (all of it really!!) I Love a good complaint letter, I’ve written a fair few…anything for a freebie! I believe in ghosts, and have seen one! (Char is a big skeptic so she of course tells me otherwise!! I’ll win her round one day I’m sure!) And I absolutely love to travel, I’ve been to Spain, Turkey, Balearic’s, Egypt, Morocco, Florida, New York & Vegas to name a few…still so much more on the list and can’t wait for me and Char to explore more of what the world has to offer, together! Char is a huge Dolly Parton fan (I plan to take her to Dollywood one day!) she loves art, craft and design (She’d love to get into property one day so watch this space) She watches Columbo (you know the detective series that started in the late 60’s! Seriously you’d think she was the older one in this relationship! Haha!) She enjoys playing football (may as well live up to the odd stereotype!!) and she’s a bit of a handy girl around the house! And now here we are. We’ve decided to blog about our relationship (because who wouldn’t want to read about 2 birds that have fallen in love and have lots of laughs along the way?!) In all honesty though we just hope to create a lighthearted worthwhile read about our interests – travel, tips for kids (coming straight from a childcare professional and a Mummy….and of course how we deal with different views that sometimes arise) Foodie topics (any recipes we’ve come across or nice places to eat, oh and my obsession with Reese’s and anything peanut butter really!!) Anxiety (Char has suffered in the past, and still does now and again – We will write about triggers and what helps) Disney (‘Cos who doesn’t like to read about Disney?!) LGBT community – being very new to all of this! Our family journey, including our little boy Finley, because at 5 years old he wants to be very much as involved as us in this blog! And lastly our funny stories past and present. Our topics may all seem a bit random but I promise we’ll make it flow! We really hope you will join us on our adventure! It’s still early days for us but we have a good feeling about this! p.s Don’t forget to follow us on Facebook, Twitter, Instagram & Pinterest etc….